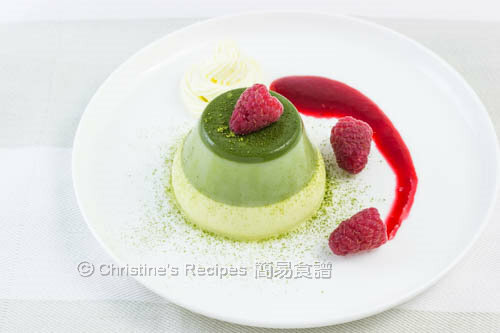 Would you think like me when you see this green tea panna cotta with vibrant green and red colours? They are wonderful for Christmas party, aren’t they? I most like the three different layers of green colours which make me feel refreshing and pleasant. Each bite of the silky smooth pudding adds an ounce of happiness. Making the layers is easier than you thought. It's just like making a panna cotta without any layers. What you have to do is to let them sit at room temperature and wait patiently. I really like the creamy and smooth texture and would love to have it after every dinner. This is the matcha powder I bought from Japan and used to make this dish. Mix the gelatine powder with water. Set aside until softened. Take 80ml of milk from the recipe to mix with matcha powder for later use. Place the remaining milk, whipping cream and sugar into a sauce pane. Heat over medium heat until sugar is completely dissolved. Add the softened gelatine powder. Stir occasionally and make sure it’s completely dissolved. Stir in the matcha powder mixture. Add vanilla extract. Drain through a fine sieve. Use a spoon to press the residing particles through the sieve if any. Mix well. Pour into the moulds. Let them sit for 30 minutes. Chill in fridge for at least 3 hours. Prepare the sauce: Cook raspberries and sugar over medium heat until the sugar is dissolved and raspberries are broken apart. Combine corn flour and water. Gradually stir in and cook to your preferred consistency. Drain through a fine sieve and discard the seeds. Set aside. To serve: Dip the mould into hot water for about 2 seconds. Turn it upside down and remove it onto a plate. Drizzle raspberry sauce and garnish with fresh raspberries. You can replace raspberry with strawberry. It doesn’t need to bring the milk mixture to a boil. Make sure the gelatine powder is completely dissolved. If you don’t want layers, you can chill the mixture in fridge once it cools down a bit. To get the best results, try to get the quality matcha powder. I used 宇治 matcha green tea powder. With other brands of green tea powder, you might get only two layers. It’s still good looking though. Would the layers form themselves? It's amazing !!! Exactly, they will automatically form layers if leaving them aside before chilling. Love the layers...it's almost like a magic cake which forms the layers itself. Can I use fresh cream instead of whip cream since its going to be boiled. Use whipping cream. It's in liquid form. You don't need to boil it. Just heat enough to melt the sugar. But, I'm surprised you didn't use Agar Agar to make them instead of gelatine. You can use agar agar instead if you like. But the texture would be a bit stiff compared with those made with gelatine. Hi Christine, can I use pectin instead of gelatine? I haven't tested pectin with this recipe. Guess that it works too. But you have to experiment and find out what quantity you need. Hi Christine! Thanks for your recipe! I have tried a several times to make these and it tastes great! However, I still don't get the layers the way you got. Do you know why in my case the matcha powder rises to the top instead of sinking to the bottom? So my panna cotta turns out to be like this: On top the middle green layer, then the white layer and the bottom layer is dark green. If your matcha powder rises to the top, it means it's very fine and light, lighter than the cream mixture. Mine is quite coarse and easily sinks to the bottom which is the darkest green. This panna cotta looks delicious! Hi Christine, i tried your recipe twice and it was delicious but mine didn't even form 2 layers. Do you know what i did wrong? thank you. I think it's because of the green tea powder. If it's too fine, it's quite hard to get layers. Hi Christine, can you tell me the diameter of the mold's base please? The diameter of bottom is 4.5 cm, top 7 cm. 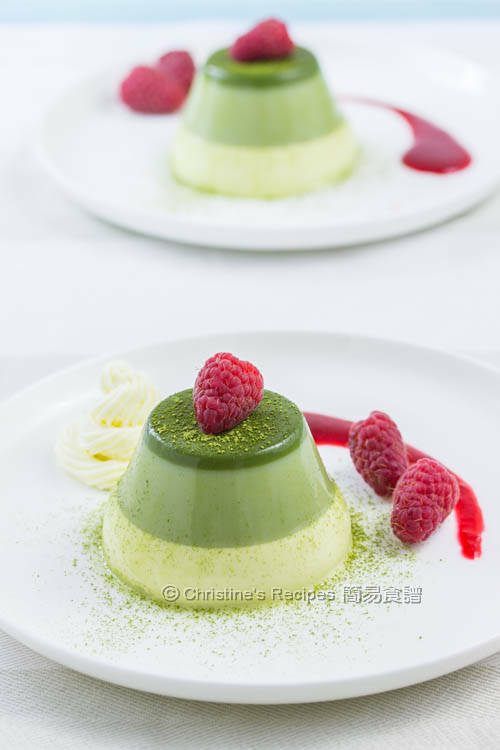 how to make this panna cotta to 3 layer? Its amazing that the panna cotta just layered itself. But mine is like white-dark green-light green-dark green layer. I've let it sit at room temperature for an hour already, but that dark green layer in the middle just won't go to the bottom. 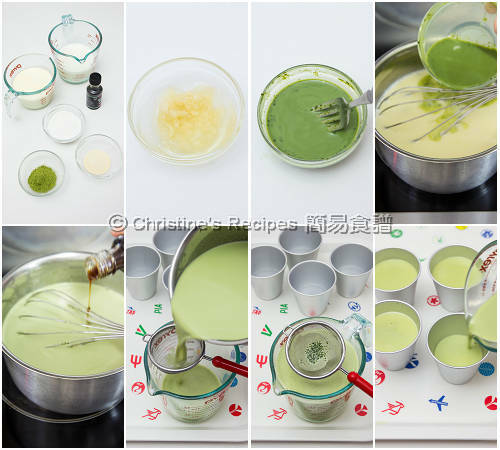 The colour of the panna cotta shown depends on the green tea powder you used. I found some brands only give yellowish or greyish colour. The good quality one should give fresh and bright green colour. The layers formed also depends on how coarse the green powder is. 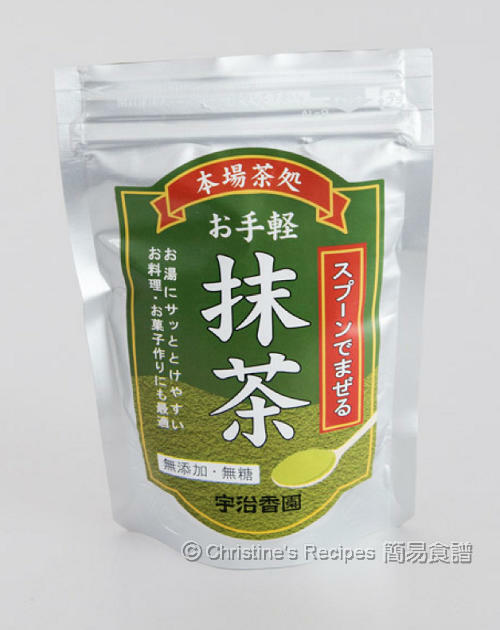 The matcha powder I used was 宇治香園, packed in a foil bag. Any other brand can work if it's coarse enough. After long search of the photo in my computer, finally got it. Updated this post with the photo. Hope it helps. Have tried this recipe twice. Love the texture and taste of it. Could you suggest why i am unable to get the 3 layer. I usually get the dark green layer at the bottom and the lighter green layer but cant seem to get the white layer. Would this be because of the milk i use?? Sorry, no idea why you only got 2 layers. It could be the matcha powder or the milk. Hi Christine. What type of milk did you use in your recipe? I used full cream milk. It's got rich milky aroma.